Noticing New York: City Is Rezoning So Coney Island’s Lower-Income Residents Will Have Place to Buy Back-to-School Shoes, Clothing and Stationery? Right. Sure Thing! City Is Rezoning So Coney Island’s Lower-Income Residents Will Have Place to Buy Back-to-School Shoes, Clothing and Stationery? Right. Sure Thing! Here is a mystery revealed: One of the main reasons the Bloomberg administration is rezoning Coney Island and eliminating a huge amount of amusement park area is so Coney’s lower-income residents will get something the city says those residents most desperately need: places to shop for back-to-school shoes, clothing, books and stationery. Do you believe that? Sure! Don’t believe the city even said such a thing? Read on. 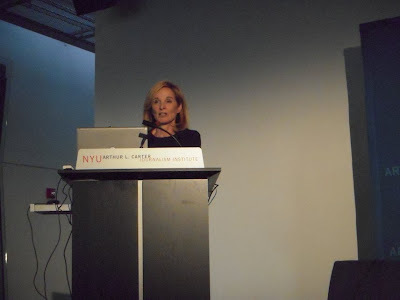 Prior NYU Symposium Coverage: How Believable That the City Shrinks Available Acres to Create an Amusement District? But first, in our last post we wrote about the Bloomberg administration’s avowal that the “primary” “objective” in eliminating a substantial amount of the amusement area at Coney Island through its proposed rezoning is “to create a new and enhanced . . . year-round vibrant open and accessible amusement district.” These quotes are from Purnima Kapur, the Director of City Planning's Brooklyn Office, speaking Wednesday, April 29, 2009 at “Which Way Coney Island? 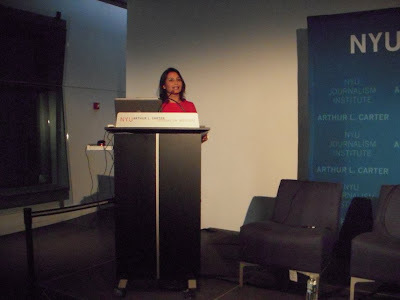 A Symposium on Its Future,” at New York University’s Arthur L. Carter Journalism Institute. A Main City Goal: Shopping for the Under-Employed? . . .Coney Island, if you don’t already know, as you’ll hear tonight, is a neighborhood of about 50,000 people most of whom live in public housing and have twice the unemployment rate as any place in the city. . . . . a neighborhood of 50,000 people many of whom live in poverty, many of whom live in public housing or in subsidized housing and have higher rates of unemployment and poverty compared to the rest of the city.
. . . we want to create opportunities for people who live here and continue to still live here, in terms of providing jobs but also in terms of bringing to them services that they’ve lacked. As Amanda said, what we heard, the refrain is, come September when school opens, people don’t have a place to take their children to buy a pair of shoes: They have to go out of Coney Island to do something as basic as that. Book stores, stationery, grocery stores, clothing stores: The neighborhood really lacks services and amenities that many of us as New Yorkers take for granted. Do these remarks seem somewhat persuasive? 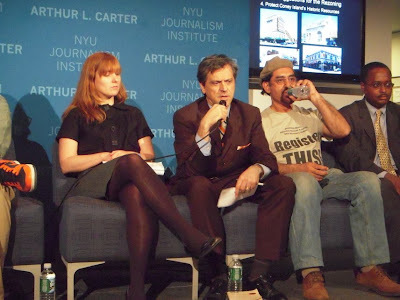 They were directed to an audience at the NYU Journalism School, essentially members of the city intelligentsia. From what is being said, the situation of the poor at Coney certainly appears dire: They can’t even buy back-to-school shoes or stationery for their children. These remarks by Ms. Kapur and Ms. Burden seem designed to convince us that their Department of City Planning has done its homework, investigating life in the community at an intimate level of detail that would assure us that they truly care about the community. That, of course, assumes that these remarks are to be believed. Don’t assume! One of the first rules of journalism is check your facts. If you don’t, you are writing fiction. It turns out that Ms. Kapur, Ms. Burden, and the folks at City Planning don’t care enough about the community to find out what the facts of shopping life in the community actually are. Either that, or they don’t care enough to tell the truth. And, aside from being well-stocked with sporting goods and clothing, the store offers a multitude of services. With their state-of-the-art equipment, they customize team, school, camp uniforms, and T-shirts, with silk screening, embroidery, and heat-pressed-on designs. 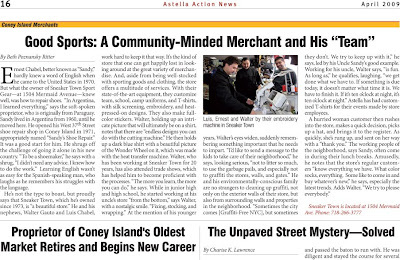 Astella Development Corporation which publishes that local newsletter has a website with a “Coney Island Merchant Directory.” The directory is fairly useful though it could use some updating both in terms of deletions and new additions. Still it provides a reasonable overview of the Coney merchants. No Coney Island shoe stores? The site lists three of them though one of them apparently recently closed. We’ll see if it is replaced by another. The two remaining stores both carry children’s shows but Sneaker Town is likely to offer the best choice. No Coney Island clothing stores? The site lists seven, including: Forever Young Kids Wear, 3T Family Wear, K & K Sports and two jeans stores. It is true there is only one bookstore, but almost everywhere local bookstores are being replaced by big centrally located stores and the on-line discount shopping available through Amazon and Barnes and Noble. We don’t mean to overstate our own case by describing Coney Island as a shopping nirvana. It isn’t, and given the low incomes and need for employment in the area you wouldn’t expect it to be. But the city is willing to overstate its case, describing it as an area that lacks the “basics” that other “New Yorkers take for granted.” The city’s willingness to overstate makes us think that the city is probably just as willing to overstate what it really intends to do for the impoverished residents of the local community. Is the city really proposing to sacrifice waterfront amusement area to provide back-to-school shopping opportunities for lower-income people or actually to put in luxury housing in the neighborhood? A Sincere City Interest in Producing More Coney Affordable Housing? This brings us to another point. Is the city really intent upon building affordable housing in Coney? Isn’t it really the waterfront luxury housing that is the point? Frankly, it is not necessarily a bad thing that the city is focusing on building housing other than affordable housing in order to even out the housing mix in Coney Island. As both Ms. Burden and Ms. Kapur pointed out, Coney’s problems stem partly from the fact that such a high proportion of its population is in “public housing” or “subsidized housing” with high “unemployment and poverty” with “twice the unemployment rate as any place in the city.” If the city identifies this as the problem, they doubtless don’t want to add to it and there is sense in their not wanting to. But then the rhetoric about adding new affordable housing is intended to be deceptive to the community. The real goal is the higher-income units, the same way that the real shopping opportunities that the city likely wants to create are for higher-income people. We wonder whether, in the end, new low income units will ever be created at Coney Island at all. There is a possibility that developers could just get credit for fixing up or maintaining existing affordable units in the neighborhood, not producing new ones. Who knows what will ultimately happen, what the city will finally be committed to, after it has won the right to eliminate amusement acreage. What About This Affordable Housing Program Not Yet Being Used in Coney? The New York City Housing Partnership programs may be building exactly the right kind of housing for this purpose. The housing involves at least one residential unit that is owner-occupied. There can be associated rental units which the owner rents out. The program can also build multi-family housing consisting of owner-occupied condominium or co-op units. The program is perfect for scatter-site infill building wherever there are vacant lots or where owners of smaller structures are willing to sell. Use of the program would probably also contribute to safety in the neighborhood, something else local residents are expressing an interest in. Coney Island’s Astella Development Corporation administers sales of homes under the above described program in the Coney vicinity. If you go to their website you will see listings for the following: Schaffer Cluster Homes, NH Emmanuel Homes, Malta Homes and Pacific-Dean Homes. Unfortunately, none of these projects involves homes being offered in Coney Island proper, though they are marketing to Coney Island residents. This kind of affordable housing program could represent a step up for current community residents (freeing up their existing units) while keeping them in the community. When such units outside the community area are marketed to Coney residents those residents stepping up are syphoned out of the community. If the city would direct these kinds of program resources to produce units in Coney Island, suitable new affordable Coney Island housing could be created for which waterfront amusement area would NOT have to sacrificed. That housing could be produced without waiting and it could already have been produced without the destructive attack on the waterfront acres. This is the sincere effort we think city ought to be pursuing. Not sacrificing amusement area waterfront would also mean not sacrificing associated jobs. Recapping: The city suspiciously says it wants to eliminate amusement area acreage (to create an amusement area). We have asked whether the city is really sincere in saying it wants to create shopping for lower-income people, and whether it truly wants to create more low-income housing. The last thing the city says it wants to create- - something that is always dangled before the poor when “economic development” is touted- - is “jobs.” Does the city really want to create jobs? The history of the destruction of Coney’s amusement area has been a history of the destruction of jobs. The amusement area once provided all sorts of jobs. Now, severely contracted, it provides far fewer. The night of the symposium another member of the panel, Alberto Vourvoulias-Bush, the Executive Editor of El Diario/La Prensa, spoke of the illusion of jobs that are offered in connection with development schemes like Coney Island pointing out how construction jobs are not only temporary, they tend to be given to people outside of the communities they are dangled before. The important jobs to a community are the permanent jobs that stay in the community. Yet the permanent jobs associated with the amusement will inevitably be fewer with a shrunken amusement area. In the past, amusement areas that provided jobs were torn down and replaced by housing for people who need jobs. It didn’t work. What is the future to be? A Plan That Capitalizes on Coney’s Real Asset? Are these approaches of doubtful city-sincerity and doubtful efficacy what Coney Island or New York City really needs? We keep coming back to the core issue: How, in shrinking the amusement area, can the city be capitalizing on Coney’s true strengths? To quote Ms. Burden’s own description of Coney, “It is one of the most, if not THE most unique and beloved beachfront destinations in the entire world . . . “totally unique because it’s an urban amusement park. It holds a place in the hearts of people across the world” and “Most, New Yorkers, Many New Yorkers think of Coney Island just as the amusements.” Or to quote Ms. Kapur: She says the most “obvious” and best “known” aspect of Coney “IS the amusement district.” Why, if the “amusement district” is already the most obvious and best known characteristic of Coney Island does that “amusement district” then need to be “created” and why should those same Coney Island amusement district acres be dispensed with to do so? We think the city has yet to come up with good and sincere reasons for what it is proposing. The City Planning Commission is still taking written testimony on its proposed Coney Island plan; testimony should be submitted soon. (Monday, May 18, 2009 is the deadline if it relates to the Draft Environmental Impact Statement, though other testimony can be submitted later.) See their hearing procedure notice for instructions. The City Planning Commission needs to be told that there are certain minimum alterations that need to be made to their plan for the Coney Island we know and love to survive. For a list of the minimum revisions that should be made to the city’s proposed plan, reflecting what is recommended by the amusement community and its ally, the Municipal Art Society, see: Monday, April 20, 2009, All Eyes Are On. . . . Coney Island. We suggest you write and demand a better plan for Coney Island, one that would be sincere and effective.